The Quiet Revolution – Or Making Waves? 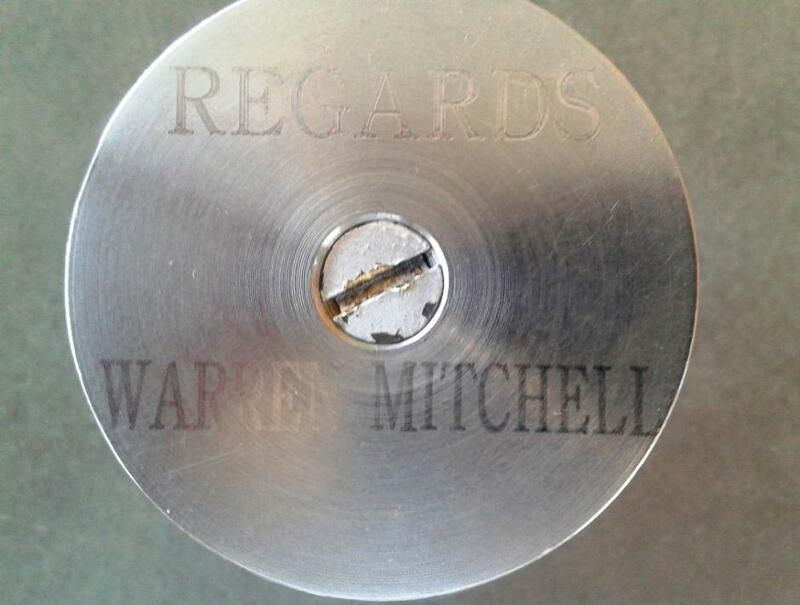 Above: Warren Mitchell, our good mate, came to the Club on Sunday May 3rd, 2015. He said the IRB is now used for surf rescues in 40 countries around the world and that the relevant authorities in places as diverse as the US, Germany, South Africa, NZ, Surf Lifesaving Association of Britain, and China acknowledge that development of the IRB for surf rescues originated at Avalon Beach SLSC, Australia. 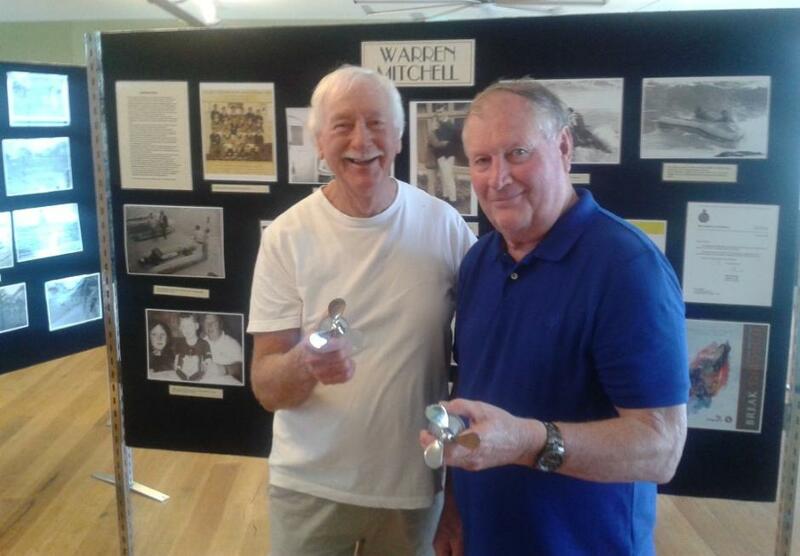 He very kindly presented a gift to myself (Roger Sayers) and one for Warren Young - miniature propellers - which I greatly appreciate. Over two hundred thousand people around Australia owe their lives to a single surf lifesaver. That’s the estimated number of people who have been rescued by the Inflatable Surf Rescue Boat, developed by Warren Mitchell OAM of Avalon Beach Surf Life Saving Club. Warren is the acknowledged “father” of the rubber duck, or IRB, the main item of rescue equipment used by Surf Life Saving Australia, and was awarded the Order of Australia in this year’s Australia Day Honours in recognition of his outstanding contribution to Surf Life Saving. IRBs are such an integral part of the surf life saving scene that it's hard to believe that they haven't always been there. It's equally hard to believe that they wouldn't be used on surf patrols today, if it hadn't been for an inspirational idea of one man, followed by perspiration and persistence. Persistence in experimenting and improving on the original primitive craft first trialed at Avalon Beach in 1969, and demonstrating it on numerous occasions at locations around the coast to convince others of its benefits. It took a long time for IRBs to be accepted by Surf Life Saving, and for their use to become widespread in Australia, New Zealand and South Africa, among other places. Today IRBs account for about 40% of all surf rescues in Australia. They are undoubtedly the fastest means of carrying out a rescue - an Olympic swimmer is no match for a 25 hp motor - and feature in the great majority of rescues carried out in dangerous conditions. Surf life saving was entirely different 30 years ago when Warren began to develop his new idea for saving lives. The belt and reel and surf boats powered by strong men were the main rescue equipment then. IRBs were seen by some people as presenting a threat to Surf Life Saving's image, as well as being of doubtful practicality in the surf. “I will never forget the night of the November l969 Committee Meeting at Avalon Surf Club. Two members and I brought in the craft which was on loan from Dunlop and the Evinrude 25 horsepower outboard motor on loan from OMC. I put the unit together and said to the meeting that this was the foundation of a new rescue unit for the SLSA. After the laughter died down, I looked at the thing on the floor and had to agree that it was hardly impressive. It consisted of a five year old well-used, ex-Army inflatable boat which had rowlocks and was painted in a grey colour that you would not use on a toilet floor. The outboard was not in great working order, as OMC believed they would never see it again. • I was not really sure it would work. Nevertheless, the Club decided that it deserved a chance and got behind it. John Fuller helped raise some money for fuel and other expenses and subsequently was involved in modifying the boat." "Off to a good start and out through the shore break. However about 20 metres out, landed some water in the boat, which slowed it and made it less responsive. Went up a wave and Don landed hard on the metal fuel tank in the bow. He turned to ask how bad the cut was to his chin. I said ‘Not too good,' as there was blood running down his neck. Made it out the back. Now to return to the beach to get some medical attention for my brother. Still a fair bit of water in the boat as it did not have self-drainers at that stage. 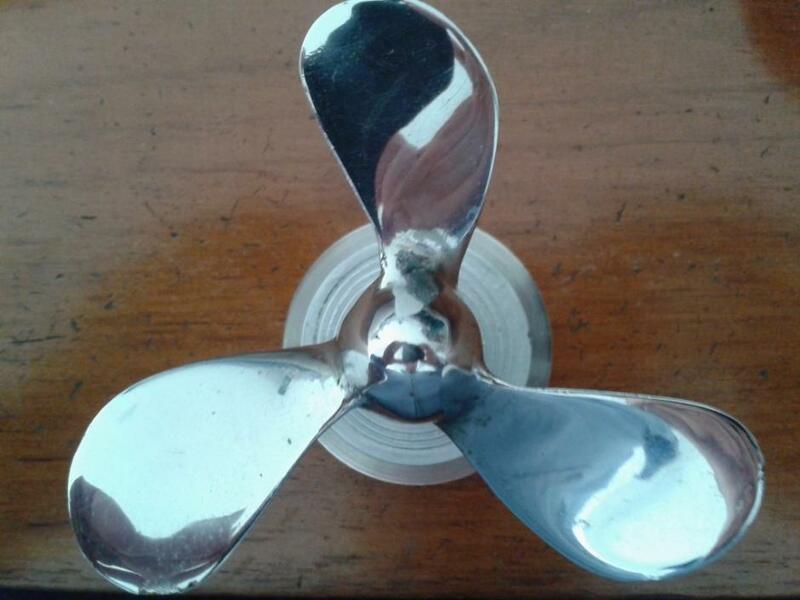 Also, I did not know that an aluminium keelson we had added for support, had been bent in four places, which further reduced the boat's performance. We were about 500 metres out in front of the Surf Club and were about to find out what speed we could do on the run in. Every thing was okay until about 200 metres out, when this three metre wave started looking down on us. Don said: "Give it the gun!" He was not too pleased when I informed him it was already on full throttle. Then the wave capped from the top and we actually cracked it! Everyone thought I had surfed the wave on purpose and the boat was acclaimed a success. Don got five stitches in his chin. Given the great air of uncertainty that had surrounded the concept, I was just a little happy to find the bloody thing worked! In creating this monster we worked against great odds. I repeat 'we’, because it was a team effort by Avalon Beach Surf Club." Craft modifications subsequently introduced by Warren and John Fuller included colour impregnation of the fabric (originally yellow, now red) to make the craft more visible at sea, a wider beam, solid keelson, flexible fuel tank, self drainers, deadman throttle and a guard around the propeller. Warren also defined other important characteristics of inflatables for surf rescue work - such as hull design, pointed bow, number of air compartments, tube diameter, size of motor, fabric thickness and lifelines along both sides. 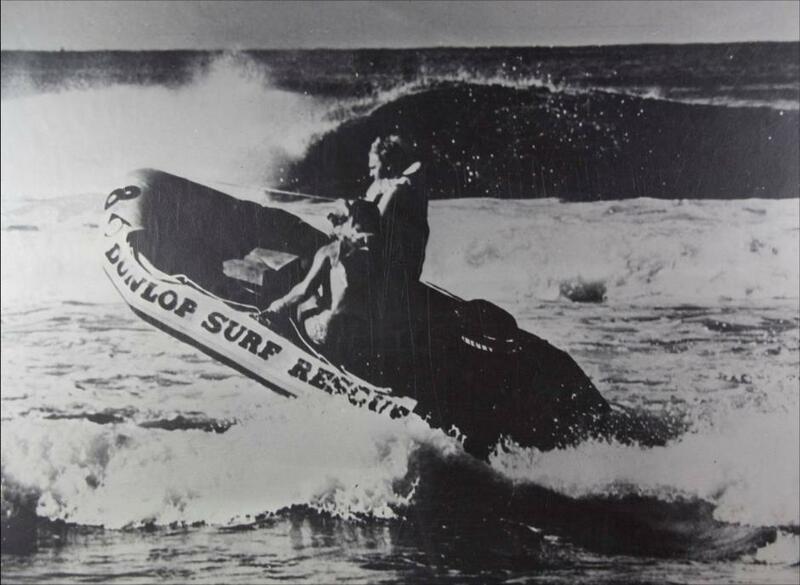 The first IRB rescue, which was also the first IRB mass rescue, took place at Avalon Beach in December 1969. Warren and John Fuller made three trips to rescue eight children caught in a rip in the middle of the beach. Another 10 rescues took place in that first season at Avalon. Warren travelled up and down the coast demonstrating the boat to other Surf Clubs and officials. At one of the earliest demonstrations in 1970 at Dee Why, SLSA officials had to ask Warren to do the demonstration rescue again as it had only taken a minute or so and they could not believe the speed of the rescue. Crews on that day included John Towner (now a Currumbin SLSC member), Ross Lumsden, Dave Plunkett, Trevor Fuller and Rick Millar. On the down side there were knockers and according to Warren there were plenty including people prepared to damn the concept without even viewing a demonstration. The thousands of people since rescued by IRBs and the lifesavers now using safer rescue methods, should be glad that the knockers' views did not prevail and that Warren's tenacity and motivation caused him to persevere. In January 1985, Warren received an Innovation Award from the SLSA as the recognised "father" of the IRB, and in this year’s Australia Day Honours, Warren was awarded the Order of Australia Medal for services to Surf Life Saving. Warren's sole objective was to improve surf rescue methods and make rescues more efficient and safer for the rescuer. He is a modest man and emphasises that other people and other clubs played important roles. He might also claim that he merely adapted equipment being trialed at that time overseas for rescues at sea. The reality is that as a result of his pioneering work at Avalon Beach, Warren single-handedly and single-mindedly developed an improved surf rescue method uniquely suited to Australian conditions and in the process revolutionised Surf Life Saving in Australia. 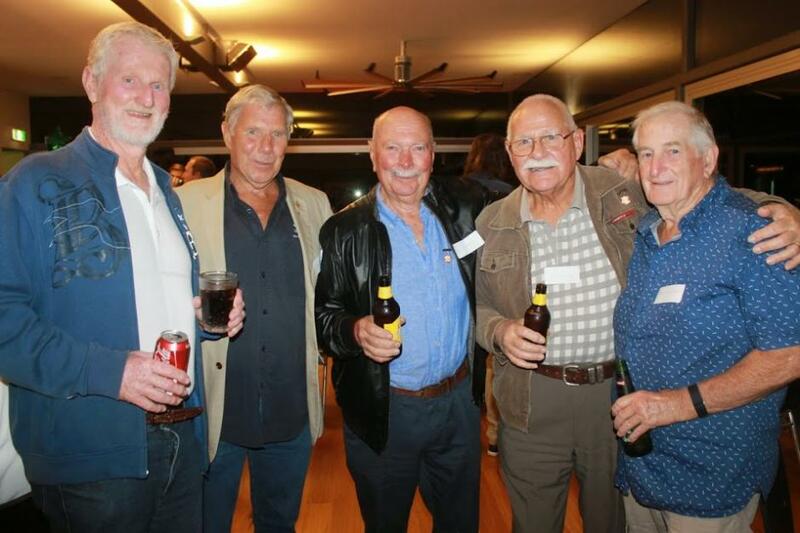 John Towner, John Greaves, Don Mitchell, Bob Head and Jim Burgess at Avalon Beach SLSC 90th Anniversary Celebrations.